If you’re coming to Rome from abroad, you’ll probably be landing at the Rome Fiumicino airport. And by the time you get off your flight, you’ll be jet-lagged, exhausted, and anything but “switched on.” No matter how excited you are to be in Rome. That’s why you have to have an idea of how you’ll get from the airport to your Rome hotel before you land. Because otherwise, that taxi driver who (illegally) approaches you at the terminal to offer you a ride, when your hands are full of bags and you’ve realized your phrasebook Italian isn’t enough to ask someone where you should go, might seem tempting. Less so 80 or 90 euros later. Luckily, getting from Fiumicino into the center of Rome by public transport is pretty straightforward. You just need to know what your options are in advance! Nota bene: If you have a ton of luggage, I’d recommend booking a transfer or taking a taxi. That’s because, when you get into the city on your train or bus, you’ll probably have to transfer to another form of public transport. Not only does that often involve some walking, but even at some metro stations—like the Colosseo metro stop—there’s no escalator or elevator whatsoever, only stairs. And if you’re in three people or more, it’s a no-brainer: splitting a taxi winds up being almost as cheap as the train. The train station at Fiumicino is located within short walking distance of the baggage claim. Just follow the signs for the train station, or ask anyone at the airport. Most travelers planning on taking the train into central Rome opt for the Leonardo da Vinci Express train. It goes directly from the airport to Termini station, making no stops, and takes half an hour. (From Termini, you have to get to your hotel on your own, however—and if you opt for a cab, it’s likely to be another €10 to €15. So always consider whether it’s just cheaper to take a cab or transfer directly from the airport, instead!). The normal, regionale train leaves from the same station at Fiumicino, also takes a half an hour, and costs just €8 each way. However, it doesn’t go to Termini. Instead, it makes several stops in Rome, including at Stazione Ostiense—probably the most useful if you’re staying in the centro storico. To get from Ostiense station to the center, either hop a cab outside the station or follow the signs for the metro; a 5-minute walk brings you to the Piramide metro stop on the B line. From there, it’s two stops to the Colosseo metro stop or four to Termini, where you can switch to the A line. If you’re staying in Testaccio or near the Colosseum, are planning on getting a cab from the station in Rome to your hotel anyway, and/or are on a tight budget, this is a good bet. Several buses run from Fiumicino to the city center. They take a little under an hour, depending on traffic, but are a cheaper option than the train. They include the SIT bus shuttle, Terravision bus (run by Ryanair), COTRAL bus, and ATRAL-Lazio bus. Each costs about €5, each way, and most go right to the Termini train station. There is a flat rate to go from the Fiumicino airport to the city center: €48, including all luggage and any extra charges. As soon as you get in a taxi at the airport, therefore, make sure your driver does not run the meter and only pay that amount at the end. It is illegal for your driver to charge you more. 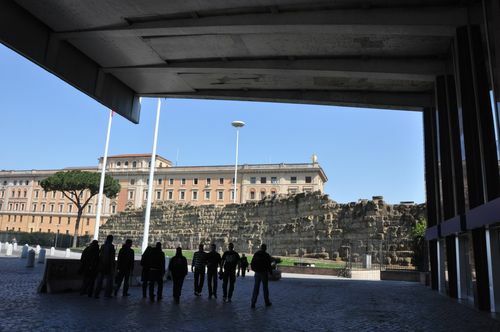 By the center of Rome, by the way, I (and the city of Rome) mean anything within the Aurelian walls. So if you’re staying anywhere near Piazza Navona, the Spanish Steps, or Colosseum, you’re good. If you have any doubt about whether the hotel is in the centro storico, ask your hotel in advance; if it’s outside of the historic center, your driver has the right to run the meter and to charge you supplements instead of the flat fare. (And probably will). 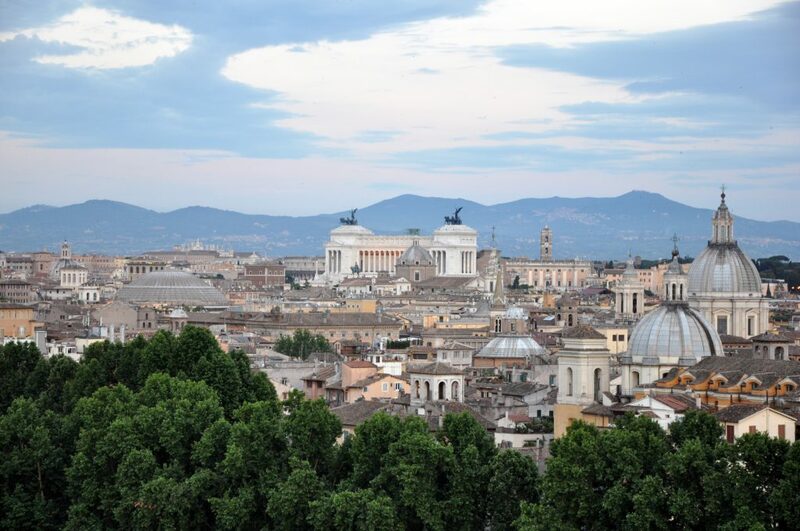 Finally, you can, of course, book a transfer with a company in advance; there are a million and one Rome transfer companies (and tour companies that offer transfers). The price is generally €65 and up, but if you don’t want to deal with the stress of making sure a taxi won’t screw you over, and you just want to be able to relax knowing that a driver will be waiting for you, with your name on a sign, right when you get out of baggage claim, then this is the option for you. 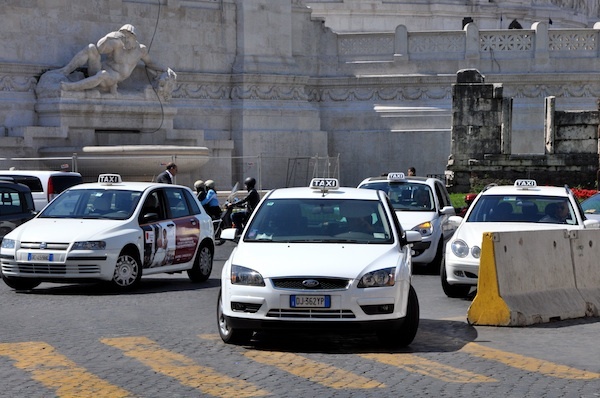 Yes: the app taking over the world’s cities has made it to Rome (much to the consternation of taxi drivers). Although the basic idea of this ride-sharing app is similar to other cities, there’s one big difference. Rome doesn’t offer UberX or the other lower-priced services; it only has the higher-end services: UberBLACK, UberLUX and UberVAN. That means that, often, taking an Uber is as expensive as (or more expensive than) taking a taxi. But it also means that drivers often aren’t “normal” people picking up some cash on the side, but rather professional drivers, which is a benefit. From Ciampino airport (which has WiFi, so you can book an Uber using the Uber app on your phone when you arrive), it should be about €40 into the center, although, as always with Uber, it depends on pricing and availability at that time. (You get a fare estimate before you book). Update, October 2017: The legal status of Uber in Italy has been changing as of late — it was banned in April, then re-legalized in May — so before you count on it, double-check by Googling it online. Coming from Ciampino airport, instead? Here is how to get to the Rome center from Ciampino. Liked this post? You’ll love The Revealed Rome Handbook: Updated, Expanded and New for 2017, which includes many more tips and tricks like these in more than 200 information-packed — but never overwhelming! — pages. It’s available for purchase on Amazon or through my site here! I’m also free for one-on-one consulting sessions to help plan your Italy trip. Ah, I forgot to mention (on the Italo post) that we are meeting my Dad at Fiumicino, so we are taking the Italo treno from Florence to Rome, then Trenitalia from Rome to Fiumicino. Do you know if they are pretty close to each other in the Rome station? Hopefully so, so we will make the 15min ‘layover’. Thanks! It’s about a 5-minute walk from the “normal” platforms to the Italo Treno platform in the Rome Ostiense station; for Tiburtina, I’m not sure. But you should be fine 🙂 Good luck! Let us know how it went! You’re fantastic. This is exactly what I needed. Thank you! I have to fly from London to Ciampino Airport Roma,how I can go buy train or bus from airport to Roma,thank you ! Hi Rita, this post should give you all the information you need. Thanks for stopping by! We will need transportation from our hotel near Trevi to Fiumicino airport. Should we let the hotel call a taxi for us, and if so, how much would we pay? Thank you. Hi Laura, your hotel should be able to call a taxi for you. I believe there will be a surcharge of €3.50 (no more than that) for placing the order with a car, plus the 48 euro flat fare. But you should double-check with them when they call. I hope that helps! Ciao! I have been living in the Monteverde area of Rome and have lots of luggage to transport back home. Is there a transfer company that you would recommend? By the way I have thoroughly enjoyed your book! Grazie mille! I’m so glad you find it so helpful, Traci. By pin, do you mean using Pinterest? If so, it’s easy. Just download the Pinterest plugin (this is the one for Chrome for example) and then you can ‘pin’ any web page at all that you find useful. I hope that helps! Pingback: Which Rome Airport Is Best to Fly Into?